Enjoy - Food & Travel: Visiting the old city of Tallinn, Estonia. I had the pleasure of visiting the old city district of the capital of Estonia last week. It is a beautiful city, with well kept houses from the Middle Ages and upwards into the late 19th century. Estonia has come a loooong way since the breakdown of the Soviet Union in the early 1990's. Tallinn is now a modern European city, and there is nothing here that reminds you of the hard times Estonia faced only 15 years ago. That does not mean that Estonia has lost all its post-Soviet trauma. The Estonians are still struggling, but they are very good at it, and the country is now one of the most dynamic of the "catching-up economies." Estonia is well worth a visit. 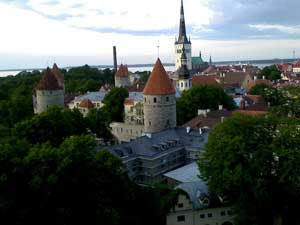 It is a small country with a small capital, and if you focus on Tallinn you can actually see a lot in one day -- at least if you stay in the old city. Tallinn is still a reasonably priced city, and compared to Norwegian prices you will get a good meal for some 10 to 20 EUR. My new Estonian friends recommended three restaurants, which we duly visited. 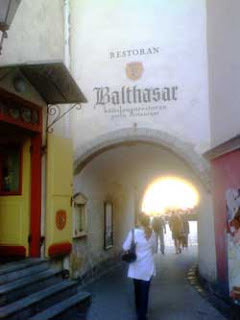 Balthasar is a high quality restaurant at the very center of the old town (by the Raekoja Square) that serves garlic dishes in a medieval atmosphere. With the exception of the coffee, every dish has garlic in it. I ate an excellent garlic creme brulee! Moskva (meaning Moscow) is not a Russian restaurant -- not really. It is now a very trendy place where even the plates carries a modern design. You apparently have to be a teenage girl to get a job as a waiter here. Pegasus is even trendier. The furniture seems to be taken out of a sci fi movie and the dishes are fusion cuisine of the extreme kind. I had a wonderful Thai style coconut soup followed by a Pakistani dish with elk! The atmosphere might feel a little cold for some, but the food is tasty. People looking for a local atmosphere apparently go to the Olde Hansa, where you can eat bear meat medieval style. My Estonian friends said that the atmosphere is great, but that the food isn't. I took their word for it. 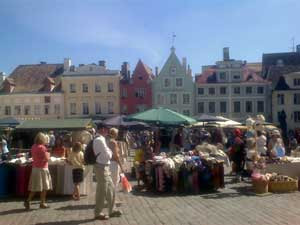 There are direct flights to Tallinn from many European capitals. People visiting Helsinki, Finland, often take the ferry over to Tallinn. More pictures can be found at Per Koch's own blog.